As the archivist on the University of Edinburgh’s Wellcome Trust-funded ‘Towards Dolly’ project, I catalogued a variety of genetics collections but rarely got the chance to delve into them from a research perspective. Over four years on the project I had become fascinated by the unique contributions Edinburgh has made in this area, most famously with Dolly the sheep, the first animal cloned from an adult cell, who was born at the Roslin Institute in 1996. But there’s much more to the story than Dolly: Edinburgh’s genetics history goes back over a century. Last year, however I was fortunate enough to receive a Wellcome Trust Research Bursary, which enabled me to spend six months researching Edinburgh’s genetics history. I was particularly interested to reveal more about how James Cossar Ewart (1851-1933) helped to establish genetics in Edinburgh. Ewart was Regius Professor of Natural History at the University of Edinburgh between 1882 and 1927, but his best-known research took place in his own time as well as on his own property. From 1895 he shared his residence in Penicuik, Midlothian with a menagerie of exotic animals (including, apparently, a tame panther). 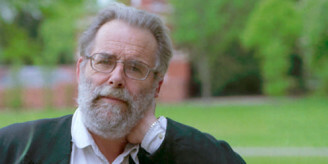 His cross-breeding experiments, particularly with horses and zebras, contributed to the various investigations into heredity taking place around Britain (and elsewhere in the world) at this time. James Cossar Ewart. Etching by W. Hole, 1884. Wellcome Library reference: 2799i. Ewart also played a major role in establishing a lectureship in genetics (the first in Britain) at the University of Edinburgh in 1911. These efforts ultimately helped secure government funding and in 1919 the Animal Breeding Research Department was established in Edinburgh. 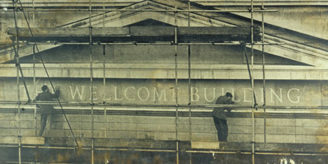 Later renamed the Institute of Animal Genetics, it developed an international reputation and paved the way for various other genetics research institutes in and around the city, including the predecessors of the Roslin Institute. Yet Ewart’s story is little known, partly because his personal papers have only recently been fully catalogued as part of the ‘Towards Dolly’ project. At 11 boxes, Ewart’s papers are not a large collection, but they are extraordinarily rich in detail. As well as photographs, press cuttings, certificates and medals, there is an extensive array of correspondence. 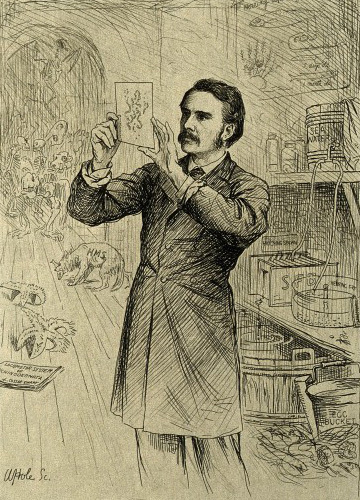 These letters show Ewart using his wide network of contacts – from scientists to animal breeders to aristocrats – to garner support for animal breeding and genetics research in Edinburgh. 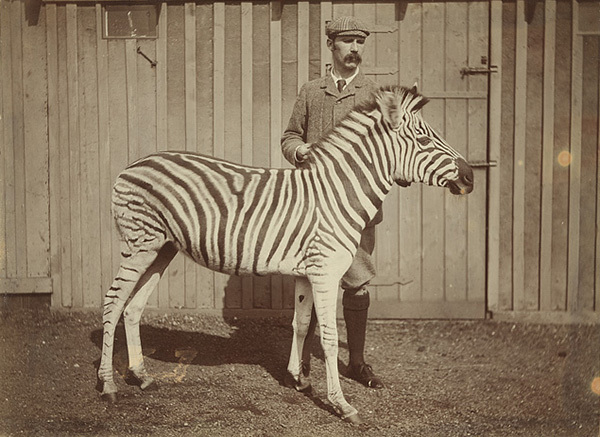 James Cossar Ewart and zebra, c.1899. Image courtesy of Edinburgh University Library Special Collections. Conducting research on the collections that I myself had catalogued was a great way of testing how well my catalogues actually worked! I also got to visit other repositories holding genetics collections. I was warmly received on my visits to Cambridge University Library, the John Innes Historical Collections, University College London Library, and the Wellcome Library, where I consulted the papers of Edward Sharpey-Schafer (the renowned physiologist who helped Ewart with his endeavours and was also at one time his brother in law). I also spent many productive hours immersed in the Wellcome’s online research resource of genetics archives: ‘Codebreakers: Makers of Modern Genetics’. My background as an archivist rather than an academic perhaps made my role on this project a little unusual. It also came in handy: after all, navigating catalogues, unearthing information and piecing together scattered resources form the basis of my day job. I had also acquired a fair amount of contextual and historical knowledge after years working closely with genetics collections and talking to both researchers and scientists. Occasionally I discovered new historical tidbits which helped to update and improve the information in my catalogues. Clare Button is a Project Archivist at the Centre for Research Collections, Main Library, University of Edinburgh. She is currently cataloguing the papers of Sir Kenneth and Lady Noreen Murray.